Now’s the Time to Flip Your Fridge and Save! Recycle that old energy wasting refrigerator and replace it with a new ENERGY STAR® certified model. You’ll save energy and you can save even more with a utility rebate! SMMPA member utilities offer rebates of $25 on the purchase of new ENERGY STAR Refrigerators, plus an additional rebate to pay for recycling your old working refrigerator. Rebate forms are available by clicking here and selecting your utility. Refrigerators that are 15 years or older use twice as much energy as a new ENERGY STAR certified refrigerator. Replacing that old energy-wasting refrigerator with a new ENERGY STAR certified refrigerator could save you more than $300 in energy costs over the next five years. Learn more and get guidance choosing the right refrigerator for your home here: www.energystar.gov/flipyourfridge. 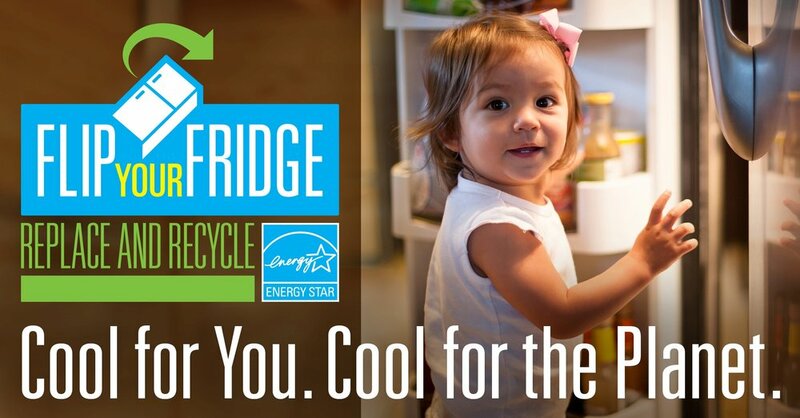 Flip Your Fridge to ENERGY STAR, the simple choice for energy efficiency!